Sealants are a safe, painless, and low-cost way to help protect your child's back teeth from decay. Sealants have been used on children's teeth for more than 20 years. 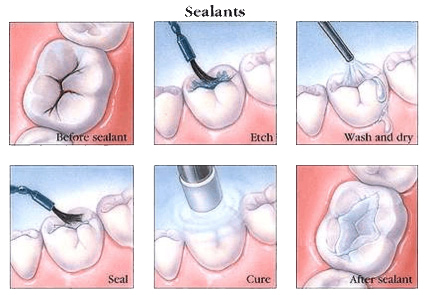 Sealants are a thin, plastic coating that is bonded to the chewing surface of the molars and premolars and is completed in about 30 minuets. This forms a hard shield that keeps food and bacteria from getting into the tiny grooves in the teeth and causing decay. They should be applies as soon as the first permanent molars erupt into the mouth. This usually occurs around 5 - 7 years of age. When the second molars erupt, they too should be sealed. The greatest chance of decay occurs during the first year after the teeth erupt. However, it is never too late to seal teeth, as long as they are free of decay and fillings. Sealants can last for 3 to 5 years. If they chip or come off, they can be easily replaced. As long as the sealants are in place, decay is less likely to develop in the grooves of the teeth. You can help sealants last by encouraging your child not to chew on ice cubes or hard sticky candy.